The Traveler's Guide To The Duat, by Kiya Nicoll is one of those books where no matter what you're expecting, it's not what you will get. 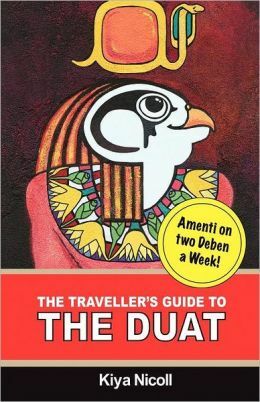 Down to it's barest essence, this book is exactly what the title says it is; a travelers guide to the Duat. At it's most complex it's really indescribable. Nicoll bases her book on the Egyptian Book of the Dead, and has many references to it in her book. Though she begins the book with an introduction on the history of the Egyptian Book of the Dead. Beyond that though, she has no other introduction to her book, nothing explaining the format, any particular word choices or anything of that. Immediately after the historical introduction she goes straight into the meat of the book. Nicoll does organize her book in an easy to understand way, and this is where it's important to understand exactly how she wrote it. She truly wrote it as if it is a literal guide to traveling the Duat. Thus, she uses words such as baggage, passport, customs and border. Thus she gives the book a rather lighthearted feel, although I did find this made it more difficult to read as traveling a place such as the Duat is a subject that is fairly serious. That being said, she covers very many topics regarding traveling to the Duat including preparing, where you can go, different types of travel, safety and returning back to this plane of existence/reality. I can see this becoming a regularly used, necessary tool for someone who follows Egyptian spirituality. At the end of the book she does include references as well as a glossary, which is very nice. I highly recommend this book for anyone who is interested in Egyptian mythology and who would want to make this spiritual journey. However, if you're a beginner to Egyptian spirituality or spiritual traveling I highly recommend getting more experience before jumping into this book.